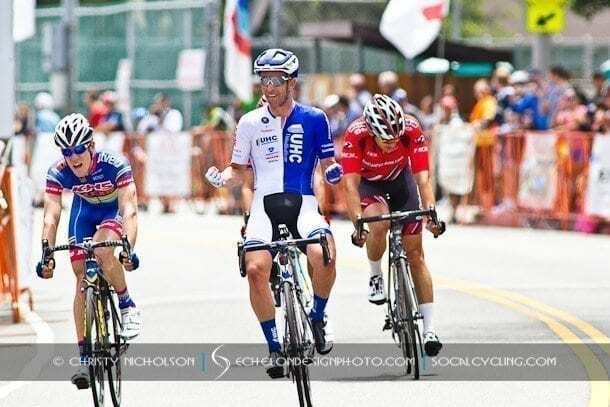 Celebrating five and a half decades of elite cycling competition, bike racers are gearing up for the Chevron Manhattan Beach Grand Prix on Sunday, August 7. This marks Chevron’s 26th consecutive year as the title sponsor of this event, which was founded in 1962 by local racing legend Ted Ernst. With Chevron’s support and that of the South Bay Wheelmen Foundation, the Grand Prix has grown to attract over 700 contestants, including the world’s top cyclists, from six continents, and over 7,500 spectators. The first race begins at 7 a.m. at Live Oak Park in Manhattan Beach, Calif. The Chevron Manhattan Beach Grand Prix features nine races catering to all levels of cyclists, as well as a wide range of community racers. New this year will be a 50 minute Junior race for 15 -1 8 year olds at 10:15 a.m., with a $1,500 purse paying 10 deep. The fan favorite kids’ races for children between the ages of two and 12, will be held at 12 noon, followed by the Women’s Pro 1-3 race at 1 p.m., which will be started by local Assemblyman David Hadley. The last race of the day will be the Men’s Pro 1-2 race at 2 p.m. Riding either a bicycle or a tricycle, kids compete for various medals and each participant receives an official race number, t-shirt, medal and goodie bag. Adult cyclists take on the challenging course in an effort to win a portion of the $21,500 in prize money being awarded that day and one of the coveted Grand Prix winners’ jerseys. Also new this year, in hopes of bringing more families to the race, will be the Chevron Kids’ Zone for children two through 12 years. This area will be featured at the Start/Finish line and include free face painting, color hair spray, temporary tattoos, hot dogs, cookies, a photo booth, balloon animals and prizes. In addition to the nine races and the Chevron Kids’ Zone, the event will include food vendors, local exhibits, and antique road and cruiser bike shows. For more information on the 55th Annual Chevron Manhattan Beach Grand Prix, visit www.MBGP.com. The 1.4-mile course circles clockwise around Live Oak Park, up Valley Drive and down Ardmore, from 15th Street to Pacific Avenue. Race fans will line the streets to cheer on the riders as their endurance is worn away with each uphill climb. The Grand Prix has attracted some of the world’s top cyclists, including several U.S. Olympic and World Champions as well as Tour de France competitors. Grand Prix Founder and U.S. Bicycle Hall of Famer Ted Ernst started racing in 1947, at a time when he estimates there were only 1,000 racers in the country. After racing in Europe and South America and lacking a sufficient sponsorship to enter the Tour de France, he packed up, moved to California, and in 1962 opened up Ted’s Manhattan Cycles. Ernst founded the event in 1962 and it has now become one of America’s oldest bike races. He was also a founding member of the South Bay Wheelmen which organizes and provides dozens of volunteers for the race. Ernst and the Wheelmen remain a driving force behind the event.